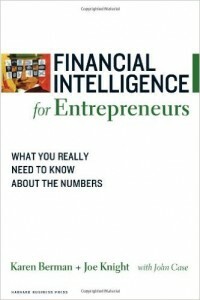 This book is about financial intelligence—about knowing what the numbers really mean. It is written for entrepreneurs and company owners who need to understand exactly what is happening in their company from a financial perspective. It provides the financial knowledge you need to run your business more effectively. In it, you’ll learn how to read the three major financial statements and how to interpret the information they contain. You’ll learn to calculate critical ratios and to understand what they are telling you. You’ll learn why your net cash in a given time period is not the same thing as profit, and why you need both profit and cash. You’ll learn to use return-on-investment (ROI) tools to analyze big purchases in order to make sure your investments add value to your business. You’ll learn about managing working capital, which helps you improve your company’s cash ﬂow and profitability even with no change in sales or expenses. You’ll read about the three main methods for establishing the value of your business and many other tricks of the financial trade. Along the way, we’ll let you in on the finance profession’s little secret, which is that finance is as much art as it is science. Many of the numbers on a business’s financial reports are determined by a whole series of estimates and assumptions. If you learn how to assess those estimates and assumptions, you will know how the reports you are seeing may be biased in one direction or another. Understanding the bias will help you make better decisions. …This book is for all entrepreneurs and company owners who want to build their business. If you’re a financial novice, you won’t find anything in here that is over your head. If you already know the basics of finance, you can use the book to review and refresh your understanding. Perhaps you are a so-called corporate entrepreneur, a manager who suddenly finds himself or herself heading a spin-off venture or a partnership with the parent corporation. If so, you will need to know the language of numbers not only to manage the business but also to communicate with the folks back at headquarters. Or maybe you operate a franchise business. This book will help you analyze your own franchise’s financial performance compared to the performance of others and compared to the parent company’s expectations. We’re big believers in hands-on experience. In the back of the book, you’ll find full financial statements for two publicly traded entrepreneurial companies. We have included some exercises that draw on these financials so you can practice working with the numbers. Of course, you can do the exercises using your own company’s reports if you prefer. We hope you won’t just read about finance; we hope you will roll up your sleeves and plunge in. That’s the best way to learn. This is an excerpt from Financial Intelligence for Entrepreneurs: What You Really Need to Know About the Numbers by Karen Berman, Joe Knight, and John Case, published by Harvard Business School Press, 2008. Copyright 2008 Business Literacy Institute. All rights reserved.